This wild Wrangler is truly one of a kind. 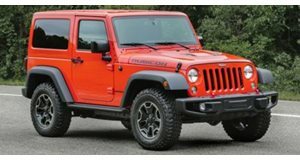 While the Jeep Wrangler is a very capable off-roader that packs plenty of power, enthusiasts love fitting it with outlandish engine swaps to help it tackle treacherous terrain at an even brisker pace. Dakota Customs will happily perform a transplant on your Wrangler with a 707-hp HEMI V8 from a Dodge Challenger SRT Hellcat. Alternatively, you can buy this unique Jeep Wrangler powered by a turbocharged 2JZGTE from a Toyota Supra protruding through the hood. It can be yours for a mere $20,000 on Craigslist. Mated to the Jeep’s standard 5-speed manual gearbox, the Supra engine packs around 350-horsepower, though the seller says it would be even faster with a larger fuel set up and an aftermarket ECU. The custom Wrangler has also been fitted with a HKS blow off valve along with a long list of modifications. It’s rear-wheel drive only, but can be configured to all-wheel drive with the addition of a drive shaft. The seller has also made the Supra-powered Wrangler stand out with a host of custom body parts. LED lights replace the standard headlamps, the front grille looks angrier, and it’s also been fitted with a custom hood and new off-road bumpers. The black Mickey Thompson wheels are wrapped in wide Yokohama AT tires to provide better grip, and the brakes and suspension have been upgraded. Inside, the wild Wrangler has been fitted with racing seats taken from an Acura RSX Type S and a racing harness. It only has 90,000 miles on the body and "much less" on the 2JZ. The seller says that the only cons are the lack of air conditioning and the heater lines have to be installed. Considering how much the extensive modifications must have cost, $20,000 for this one-of-a-kind Supra-powered Wrangler sounds like an absolute steal.